Narrator: They used their balls as weapons in a brave kamikaze attack. 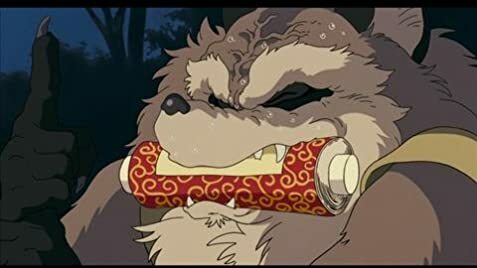 Q: Why are they called raccoons in the English dub when a Tanuki is a raccoon dog? I was expecting a movie about stupid little raccoons that would be boring and unoriginal. However it was far from that, it was fun, original, exciting and moving. I'm upset by how many people think it's bad! It's moved me more than any other movie has in a long time. It's the story of a bunch of shape shifting raccoons, whose forest is slowly being destroyed by humans. I would normally assume that with that plot it would be a preachy, boring "WHY MUST WE HURT OUR MOTHER EARTH?!!!!" style story but it's not at all. It's from their point of view, not in a way that's overstated. No big sweeping scores or little raccoons finding a potato chip bag and shedding a tear. Along with their magical powers of shape-shifting (which often includes using their testicles... I'm not making that up), they persevere and fight on. It's not an epic, it's not manipulative at all. It's set more or less in the real world, at least the imagined world where raccoons can talk is portrayed realistically. This movie is hilarious, and a hell of a lot of fun. It's an excellent 'escape' movie. It's a cute fun filled world, the raccoons go through tough times but they don't sit around crying about it. It brought me back to that feeling as a child when I would watch Disney movies and feel the "magic" (which now that I'm grown up is just "escapism".) This movie isn't for critics. If you think that little raccoons playing with their balls and having fabulous adventures are stupid then you can go and re-watch 'Citizen Kane.' Don't go into watching this movie with a serious attitude or critical eye, just feel the fun. Don't be a critic and "compare it to other Ghibli films", who cares about how "GOOD" a movie is, if you don't enjoy it. It's not about how many fat middle-aged critics like it, it's about how it elicits emotion in you. 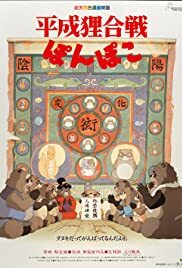 So don't view this movie as another "movie", it's about feeling like a kid again and just having a lot of fun watching these amazing raccoons. An all around excellent film, a good antidote to a rainy day! 10/10.